It seems that “laboratory” as the de facto metaphor for cutting-edge contemporary spaces has been dethroned by “shed.” From The Shed’s recent opening in NYC to the Boston ICA Watershed’s inaugural season, the humble suburban dad’s backyard retreat is suddenly a touchstone for avant-garde arts spaces trying to distill their ethos into a single word: shed. Perhaps it’s because “shed” is quainter and more approachable than “warehouse,” “factory floor,” or “studio.” Its connotations are do-it-yourself scrappiness and approachable for the public, yet still studious and incubatory. And the ICA’s decision to keep some of their converted warehouse’s original industrial features help reinforce this identity. Small patches of graffiti dot the concrete walls, and a knotted chain hangs from a large bracket near the ceiling. 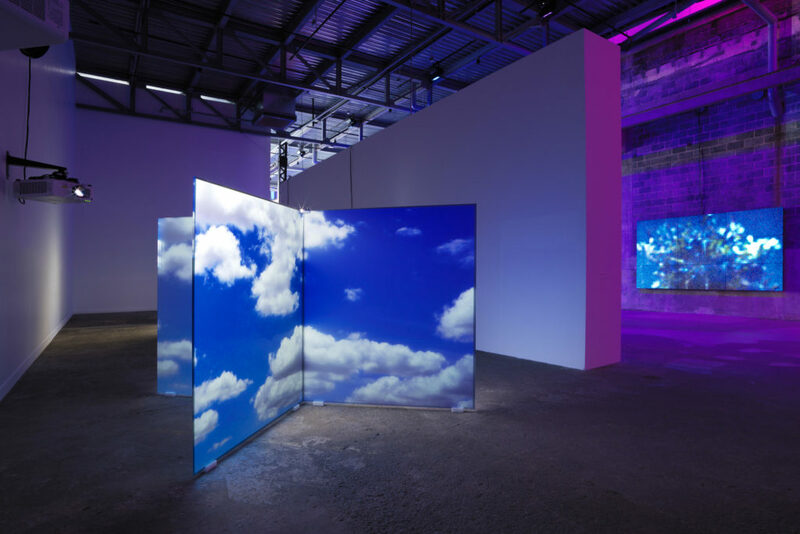 Installation View, Diana Thater, ICA Watershed, 2018. Photo by Kerry McFate. Courtesy the artist and David Zwirner. Of course, “watershed” does not really point towards the prefabricated storage units for sale at big-box hardware stores—at least not primarily. It’s a “watershed moment,” a turning point or critical origin, a moment when things abruptly and influentially change. It’s also a literalizing portmanteau. “Water,” just beyond the back wall of the arts space in the Boston Harbor, and “shed,” the former warehouse the ICA Watershed now occupies where presumably ships were pulled in for repair. As an arts institution, the Watershed sets out to encompass all these things: a turning point for East Boston, a continuation of Boston’s legacy and identity, and a restorative space for civic engagement. Diana Thater, the institution’s inaugural exhibition of its first season, is at the very least a masterful activation of the venue. Sparse but not under-populated, Thater’s series of video installations play to the building’s strengths, such as texture, scale, and lighting. The exhibition’s focal point is an installation of four projectors oriented at various competing angles, three projecting onto the corner between two walls and the fourth pointed down towards the floor. The videos show socializing pods of dolphins coupled with footage of divers floating through reefs. The surrounding space is illuminated with soft, glittering changes in light and color that recall sun beams through tidal waters. Among the projections and their ambient light, the low-hanging projectors feel like submerged surveillance devices, sunk below the surface with black, waterproofed cords connecting them to power sources and marine researchers on a boat just above. In situ, these projectors appear as if they are both projecting images and recording subjects: both casting and collecting data. The true gem of the exhibition is hidden behind a partition in the back of the gallery space. Thater has bisected two sheets of semi-opaque plexiglass and fitted them together to create an X set flat on the floor, about four feet tall. From the partition, two projectors each cast video onto two of these plexiglass forms. Cycling through a series of clips from landscapes to clouds, I caught the sequence of elephants bathing on one X and a sequence of armed men guarding a grazing rhino from possible poachers on the other. Between the soft glaze on the plexi and the ephemeral quality of the projection, these grand beasts are rendered warmly, softly, and fragile. Illuminated like a transparency in a lightbox, the scenes have an incredible, portal-like depth of field as they play on plexi. Thater’s exhibition is not radically reparative or civically-minded in the sense of traditional satellite arts incubators like MoMA PS1, MOCAD, or Stony Island Arts Bank. Her installations are still empathetic, but they push the idea of “civic” one step further. Diana Thater calls the public to emote for and with the creatures on screen, and to consider how distorted our view of nonhuman animals has become the further we retreat into urban spaces. In this way, Thater’s work is civic-minded in a global, ecological scale. It’s a kind of civic engagement that puts “grass” and “roots” back into “grassroots,” another heavy portmanteau. In the words of Donna Haraway, “the task is to make kin in lines of inventive connection as a practice of learning to live and die well with each other,”1 “each other” referring not just to fellow humans but to the wider ecosystem to which we are beholden but desperately trying to forget. Clearly, Diana Thater has not forgotten. Diana Thater ran at the ICA Boston Watershed through Oct 8, 2018. 1 Donna Jeanne. Haraway, Staying with the Trouble: Making Kin in the Chthulucene (Durham (N.C.): Duke University Press, 2016). 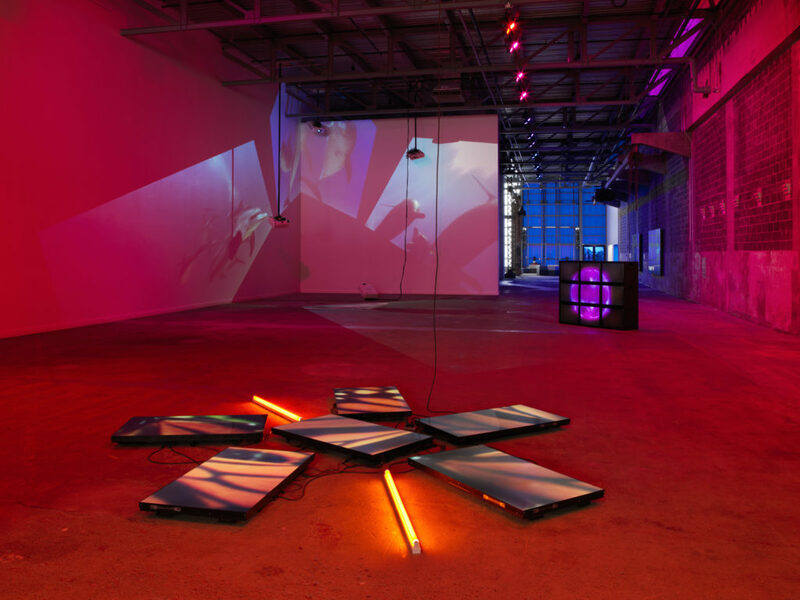 October 22, 2018 | Filed under Art Seen: National and tagged with Boston, Diana Thater, ICA Watershed, Kat Lukes.